Well, Christmas has come and gone… I hope you all had a wonderful holiday season full of family, friends, food and great memories. It is freezing here in Ohio and there is just something about cold weather that makes me crave mint… mint tea, mint bath products and mint desserts. Santa was good to me this year, so I am all stocked up on mint tea, Twisted Peppermint products from Bath & Body Works and now my blog is going to be full of mint desserts! First on the menu is a decadent and delicious recipe for Chocolate Mint Brownies. These are pretty simple to make and in my opinion, they have great visual appeal. Brian took these to work where they received rave reviews…I think this minty treat make a great addition to your New Year’s Eve party or your football feast! Have a great day, thanks so much for stopping by! Stay warm and stay tuned for more minty madness! In the bowl of your electric mixer or with a hand mixer, beat all the ingredients until smooth. Add a few drops of green food coloring if you want the frosting green. If the frosting is too thick, add a little extra cream. (The frosting should be just thin enough to spread.) Spread the frosting evenly over the cooled brownie layer. Place in the refrigerator for about 5-10 minutes or until firm. In a heatproof bowl over a saucepan of simmering water, melt the chocolate and butter. Spread over the mint filling and refrigerate for about 30 minutes or until the chocolate glaze starts to dull. - I did not want the green color to be as dark as I made it, but I tend to have a heavy hand with gel coloring. - I ran out of chocolate for the chocolate glaze layer, so I improvised by heating 1/2 can of chocolate frosting for 10 second in the microwave, stirred it well and poured it over the mint layer. It set up beautifully in the fridge. 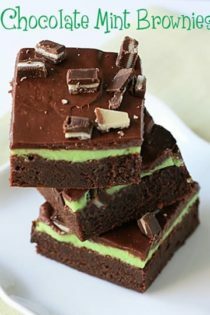 - I added chopped Andes mint candies to the chocolate layer as a minty garnish. I am totally trying these when I get home! Oh yeah!!!!!!!!! I'm so making these! Thanks! Merry Christmas! These look like the perfect way to celebrate – yum! Those do look de-licious! Happy New Year! Will certainly be trying these with crème de menthe! Great alternative to mint extract. Your post brought back great memories of Andes Mints – I haven't had those since junior high! Wishing you a fantastic 2010! These sound refreshingly delicious! I love the green color in there, festive! Those are just so pretty. My son would go crazy for these. Happy New Year! They are pretty with that minty green layer and chopped mints on top! I've missed a lot this month. :( But I'm glad to hear that Santa was good to you. look super delicious! happy new year! Made these today after finding them on your blog. Absolutely LOVE it! I can't wait to bring to work tomorrow to share this minty goodness. I LOVE the addition of the andes mints on top! THANKS for the recipe! I've already written this out and added to my recipe file!! Mmm, I used to LOVE Andes mints when I was little! 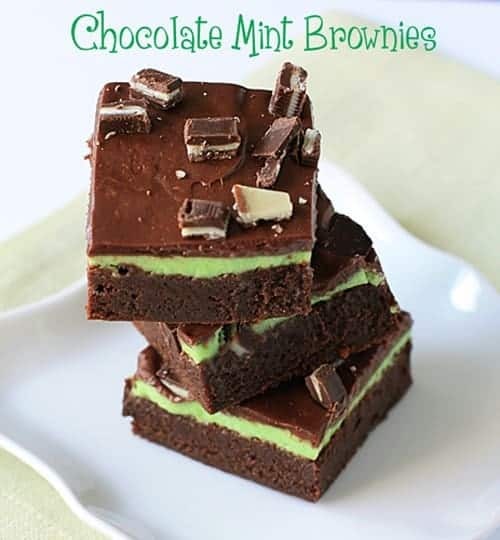 These look great, chocolate and mint is such an awesome combo! Soo delish! I love anything chocolatey and minty! oh my these look so good! my husband isn't a fan of the mint chocolate combination, but i adore it! my husband says it tastes like toothpaste :(. i will make these anyway hehe. Oh man, I am both a chocolate AND mint addict. These brownies are going to be sending my tastebuds into overdrive! oh my goodness………………..yes, you want to make these! I hit the jackpot today. I found six recipes here that I want to make and I just got started. Your photos are great. Thanks. I made these yesterday for a friend who was begging for something minty. They were AMAZING! Thanks for the recipe! OMG I am SOOOO making these! I think My family will just ADORE them!!! Thanks for the recipe!